To better compete against more premium alternatives like the BMW GS and KTM Adventure (not to mention more evenly matched rivals from Kawasaki, Yamaha, and Honda), Suzuki has pulled the 2014 V-Strom 1000 into the 21st century with modernized styling and headlights reminiscent of the brand's GSX-R and Hayabusa models. The reworked 1,037-cc, 90-degree V-twin has been coupled with a three-mode traction control system (high, low and off), and the requisite chassis, brake and suspension improvements have been implemented, including the addition of anti-lock brakes. 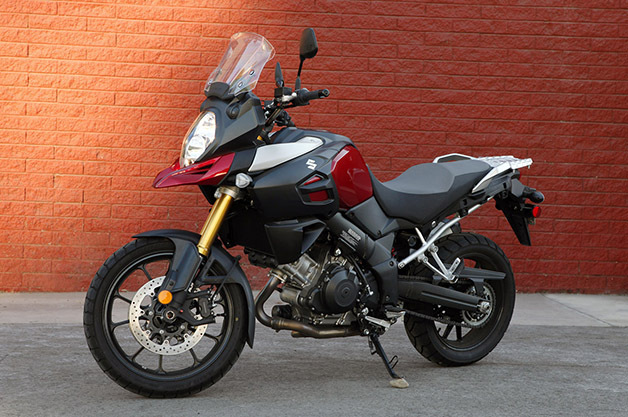 The V-Strom enjoys subtle proportional changes, starting with a narrower engine that enables a slimmer fuel tank. Despite its more compact proportions, the tank holds a bladder-busting 5.3 gallons. Though the chassis is more rigid, the new frame is also 13 percent lighter than its predecessor. The engine also sheds weight thanks to a more efficient cooling system that eliminates the need for an oil cooler. The pistons are larger, yet possess the same weight and stiffness as their predecessors. Other improvements include 10-hole injectors on each throttle body (replacing 4-hole units), which offer greater combustion efficiency and, as a result, better fuel economy. A new single-can exhaust saves weight and lowers the center of gravity, while an ECU-controlled butterfly valve optimizes backpressure. The updated transmission includes a redesigned sixth gear for smoother operation and a slipper clutch for more seamless downshifts. Compression and rebound-adjustable KYB forks manage front suspension duties, while the rear is handled by a link-type single shock coilover, with rider-adjustable damping via a dial beneath the seat. Other additions include a 12-volt outlet for charging accessories, a reshaped saddle that's lower and more comfortable, and a wind-tunnel-developed windscreen that adjusts three ways up/down and three ways fore/aft. Sticking to the modern adventure bike's city slicker theme, my test of the big-engined V-Strom 1000 ABS covered a broad variety of Los Angeles tarmac, from pothole-ridden alleys and rippled concrete superslabs to glassy smooth avenues and jagged canyon roads. Why no offroad? For starters, the biggest V-Strom you'd want in the dirt is Suzuki's 650 variant (a.k.a. Wee Strom), which tips the scales at a still-reasonably-hefty 472 pounds; the bigger 'Strom's 502-lb mass can still be ridden on loose bits, but it's not exactly the optimum tool for the job, let alone the fact that its ABS cannot be switched off. Finally, just like those aforementioned Land Rovers and Benzes, a vast majority of adventure bikes never see dirt, instead performing their duty as look-cool/go-fast urban tools. Despite its lowered saddle, it still takes bit of a climb to hoist my five-foot, eleven-inch frame and 32-inch inseam onto the V-Strom's 33.4-inch perch, an altitude that's somewhat excused by the bike's generous suspension travel. Seated square in the middle, my boots nearly flat-foot with pavement when the bike is perfectly perpendicular, though standing on the balls of my feet is still necessary at stoplights. The view from the biggish seat feels notably more modern than past V-Stroms, with a multifunction LCD display that includes ambient temperature, gear position, instant and average fuel economy figures and a clock, among other information. The big 'Strom's V-twin fires up with mellow vibration and a noticeably loud valvetrain gear whine. Pull the relatively low-effort clutch and tap the shifter down, and you'll feel a mechanically satisfying click as first gear engages; the clutch is easy to modulate as it lets out, and the engine's ballsy power output conjures strong acceleration from low rpms. Unlike parallel twins or inline four-cylinder engines, the V-Strom's big-displacement V-twin creates a thick low-end powerband that makes it a blast to launch off the line – sort of anathema to the bulletproof, sterile stereotype of over-engineered Japanese motorcycles, which gives the 'Strom more in common with big-bore Italian bikes than you might expect. Gun it off the line, and the traction-control light might flicker for a few microseconds as the rear tire claws into earth, but the interruption in power delivery is brief enough to be inoffensive. Similarly impressive is the engine's flexibility as it winds up through the rev range; the analog tachometer's redline starts at just past 9,000 rpm, and the needle pulls strongly until it finally buries itself softly within the crimson zone. The V-Strom gets up to speed quickly, and its wide handlebars and tall stance lend it a commanding presence, with excellent visibility for traffic ahead. Though the suspension leans towards the softer side, there's nice, sharp steering response and a generally buttoned-down demeanor that makes it feel stable during high-speed maneuvers. Conversely, the Tokico four-piston monoblock front brakes do an excellent job of decelerating the bike with good lever feel, along with a strong rear 10.2-inch disc that also works effectively. The windscreen is designed to tilt with a nudge on its left edge (in order to keep the throttle hand at the grip), and though the spring-loaded mechanism sometimes sticks, it becomes easier to achieve the desired windscreen angle once you've become acquainted by fiddling with it a bit. More crucially, however, I found it almost impossible to avoid a certain amount of windflow hitting the top of my helmet at highway speeds, even with the windshield in its highest position. The effect would probably be diminished or entirely lost with the $13,999 Adventure model (which adds a tall windscreen, saddlebags, handguards and an engine guard). The V-Strom's road manners feel planted and secure at almost any speed, but the short windscreen does the bike no favors, especially since it undoes some of the exhaustive engineering that has made this such a excellent all-around bike that's quick, comfortable and relatively affordable. Even in its out-of-the-box, accessory-free form, the V-Strom proves itself to be an endearing motorcycle because of its honest sense of purpose, well-sorted chassis, and ballsy motor. Though few will ever see dirt, it's just as well for Suzuki's plus-sized adventure bike: this big boy manage to smooth out rough urban roads, making it perhaps the ultimate affordable commute machine for those who don't mind bringing a little offroad style to the city.